I have never loved a miniatures game as much I have with Warmachine and Hordes. I was a Warhammer 40k player many years back for the longest time, in fact I was a WH40k elitist saying nothing would be as good as Games Workshop’s cash cow. Well my friends wanted to buy starter battle boxes, and I decided to go along with it just for the heck of it. 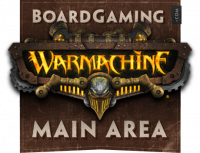 Warmachine is in a magical steampunk-like setting, where war has broken out in the Iron Kingdoms. We have factions such as Cygnar, imagine a an industiral/victorian America who love Tesla coils. Then we have the militaristic Khador who is really Russia. Then we have the nightmare empire of Cryx, a legion of amalgamations of metal and corpse flesh ruled by iron liches. Protectorate of Menoth, they are as fanatical and war-driven as the Inquisition and the Crusades, off to cleanse the Iron Kingdoms of heresy and enemies of their deity with fire…lots of fire. That is just a taste of available factions for this amazing miniature wargame. I never knew how simple and easy the list building and numbers game was. The point costs were incredibly small, I bought the Magnus the Traitor battle box and found on these steamjack’s cards they costed from 4 points, to 8 points! An average game is about 35 points and other times are 50 points. I did not need to do tedious things such as shopping through a war gear list like WH40K to equip my units and tack on small insiginifant costs in a 2000 point army, what you see is what you get on the model’s card. In Warmachine models and units in this game come with a card with their art, stats, weapons, point cost, abilities, a very clever idea as I no longer need to open my faction book every time. I play the Protectorate of Menoth, Skorne, and Mercenaries. I see myself playing this miniature wargame for years to come! If you’re already into Wargaming, this is a great way to increase your tactical ability. If you are not into wargames yet, this is one of the best ways to start. As you build your army, you can start playing (as opposed to other big wargames that require you have a full 1500+ point army in order to actually “get” how the game plays. Each army is well balanced, and also has their own style. Honestly, given the constant product support Privateer Press offers, just go with the faction that looks coolest to you. It is important to note that both Hordes and Warmachine are the same system, but use a different magic system each. In Warmachine, you use a Warcaster who allocates out their magic for themselves and the Warjacks (steam powered robots, essentially), whereas in Hordes, an army’s leader is a Warlock who aggrevates the monsters under their control in order to gain magic for their own spells. I’d played miniature games for around 15 years before getting into Warmachine, but even after several years I never got that comfortable, competent feeling of knowing how to use your army most effectively against your opponents. Warmachine is full of acceptations, and units with special powers, although Mark II has leveled this out a bit. Because of this, a beat down can quickly turn into a win if you can catch your opponent by surprise. To really master the game, you have to know about every unit in the game, so that your opponent doesn’t catch you by surprise and ruin your plans. Before I came across Warmachine, every minis game I previously came across had thick tomes for rule books. Warmachine broke that mold and built a simple and easy to learn system that controlled everything on the table. It was a thing of beauty the first time I read through the rules. Add a Review for "Warmachine"